It was a real giant leap in performance. We had the same experience in speech recognition in that we got early stages of the auditory cortex which were reverse engineered. And those were also counter intuitive, but we applied them to the transformations in our speech recognition program and got a big leap in performance. So there is some useful information to be found in reverse engineering the human brain. It will expand the AI tool kit. And all of this is gearing up exponentially, the spatial resolution and the amount of data. We’re also showing that we can simulate regions of the human brain and these simulations are a completely different level than trying to simulate at the molecular level of neurons, for example, although that’s also very valuable. You do need to understand one level of science before you can go up to the next. So you have to understand physics before you can understand chemistry. But chemistry has it own rules. You need to understand chemistry before you go up to levels of biology, but biology has its own rules. 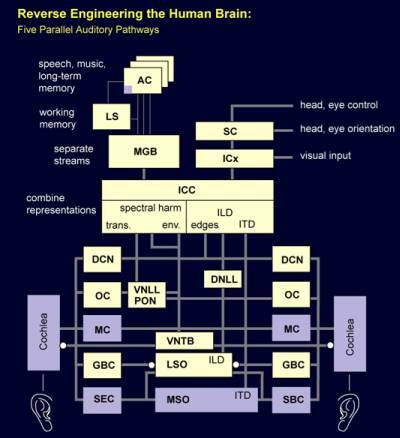 This is a block diagram of 12 regions of the auditory cortex, and as mentioned earlier, they’ve applied sophisticated psychoacoustic tests to the simulation and get similar results as applying the same tests to human auditory perception. This doesn’t prove the model and simulation is perfect but it does show it’s pretty good. 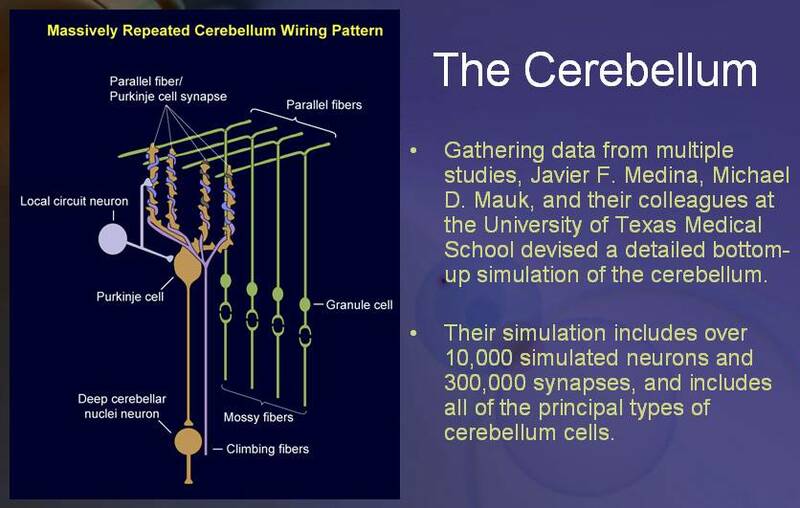 There’s a simulation of the cerebellum, which is comprised of more than half the neurons in the brain. The simulation is not of that many neurons, but it can easily be scaled up. And then they apply skill formation tests- the cerebellum is responsible for skill formation- and get similar results. This brings up an important issue which I think has come up a number of times this morning, which is how complicated is the human brain? We need to distinguish between the human brain as it’s manifested versus the design of the human brain. Because if you look at the human brain as it’s manifested in a mature person, it’s vastly complex. We can argue about the amount of complexity, but there are a hundred billion neurons and thousands of connections per neuron, so that’s a hundred trillion connections (these are all order of magnitude), and thousands of ion channels for a connection and so forth. That’s a vast amount of complexity. I’ve estimated it would take thousands of trillions of bytes of information to characterize the state of the human brain: that might be low. But the design of the human brain is a billion times simpler than that. How do we know that? Well, the design of the human brain and body is in the genome, and the genome doesn’t have very much information in it, relatively speaking. There are three billion rungs, or six billion bits, or a hundred billion bytes, but it’s replete with redundancies. One system called ALU  is a lengthy sequence is repeated 300,000 times, and there are many other sequences like that. I show in the book how you can, using lossless compression and knowledge of the structure of the genome, compress the genome, including the junk- the so called junk which isn’t junk because it effects gene expression. We can compress the whole genome into 50 to 100 million bytes. This is not simple either, but it is less than Microsoft Word and it’s a level of complexity that we can manage. They might say how can that be? How could something that is 50 to 100 million bytes then describe an entity that’s a billion or more times complex than that? Well, the relationship of the genome to the brain is the relationship of a description of a recursive probabilistic fractal to the expression of that fractal. You’ve all seen this image. In fact it’s on the cover of a book called Complexity . It’s a very complex image: it’s the Mandelbrot set. And how complex is it? Well, the manifestation of it could be billions of bytes depending on what resolution you present it in. As you zoom in on small regions, you get more complexity. There’s complexity within complexity. 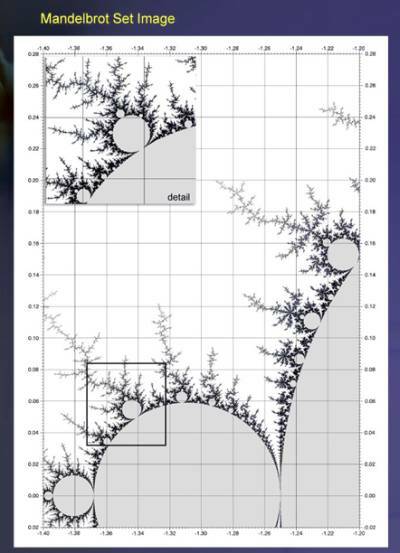 But how complex is the design of the Mandelbrot set? It is six letters long. 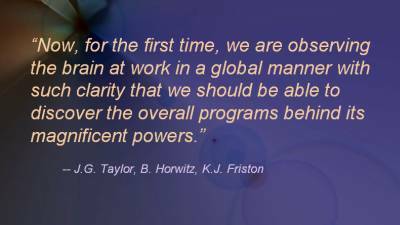 And that is a good example of the relationship of the genome to the brain. Take the cerebellum, for example. 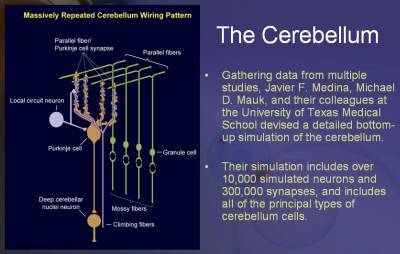 If I asked you to reverse engineer the cerebellum and I show it to you and you see the trillions, literally, of these deeply intertwined connections you’d say this is a vast amount of complexity. But it has been reverse engineered. There are only a few genes that control it and there are only a few tens of thousands of bytes in the design. The genome says there are four different types of neurons, that one module is organized like this, and now repeat ten billion times, and add a certain amount of random variations within the following constraints with each repetition. That’s a summary of what the genome says about the cerebellum. There’s tens of thousands of bytes and it creates this system. It looks very complex. It’s stochastic, which means large elements of it are random, but it’s self-organizing, and that’s the key to its brilliant design. As a child learns to walk and to talk and to catch a fly ball, it gets filled up with meaningful information as it self-organizes. While the design is not simple it’s a level of complexity we can and have figured out, and the design, as it’s manifested, is much more complex. This is interesting. This is the early visual cortex that’s been reverse engineered. It’s interesting in that we receive a lot of data into our eyes, it’s a high bandwidth of information going into the early part of the optical system. 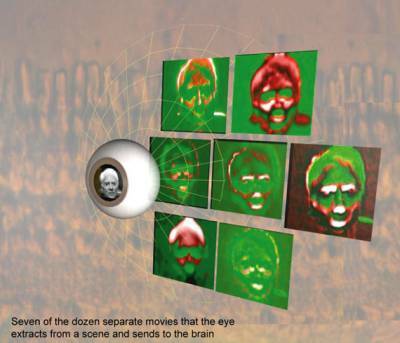 But in the early visual cortex, it gets reduced to seven very low resolutions, very simple movies, where each movie is looking at certain types of features. It’s sending these very sparsely coded seven different movies. And that’s all that the rest of the brain ever gets. 1. Tomaso A. Poggio, Ph.D. - the Eugene McDermott Professor at the Department of Brain & Cognitive Sciences; Director, Center for Biological & Computational Learning; Member for the last 20 years of CSAIL/the Artificial Intelligence Laboratory at MIT; and, since 2000, member of the faculty of the McGovern Institute for Brain Research. 2. ALU - An Alu sequence is a short stretch of DNA originally characterized by the action of the Alu restriction endonuclease. Alu sequences of different kinds occur in large numbers in primate genomes. In fact, Alu sequences are the most abundant mobile elements in the human genome.